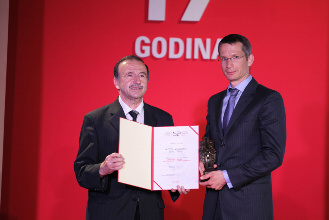 Metal-Cinkara is the only company from Slovenia which operates on Serbian market, and it received Regional award ”Biznis Partner 2011” on June 23 during official award ceremony in Continental hotel in Belgrade. The award »Biznis Partner« is awarded since 1995 and at this time it has grown into a prestigious regional business and public recognition. In the selection procedure – starting from nomination to final decision on the award – a large number of companies, institutions, associations and printed and electronic media participate in the procedure and use strit criteria for choosing the company, among the nominated companies, which has fulfilled the ten demanding criteria at the highest degree. ”The business magnificence of the company Metal-Cinkara has been the best recognized and evaluated by their business partners, and their choice has also been confirmed by the results of an independent research. The final decision was reached based on the analysis of all of the obtained results which confirmed that company Metal-Cinkara achieved good business results, followed a high degree of professionalism and ethics in cooperation with business partners, clients and buyers, and, besides the above-mentioned, it also took into consideration wider social interests, the needs of the local comunity and ecological awareness.” Congratulations!